Hearty congratulations K[laaske] on your birthday and we hope that you may celebrate it for some more years with all yours and that we may read about it in your letters for some more years. Thank you for the letter we received in which you told us so much about the 50th anniversary of your marriage. It must have been a real festive day, unforgotten for every one. We may enjoy it by reading your letter. The letter still lies here on the table with my writing tools because not all the children read it yet. Those living nearby [children] already did and day after day I expect Jaantje but they are busy too. They are planning to go to San Francisco for a day to go to the show with their oldest girl, they promised her so. I'll go with them that day to visit Geertje, they live in Oakland and they have to pass that city. 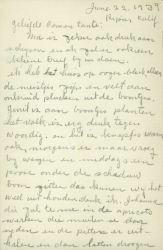 So they will bring me there in the morning, I also could go with them to the show but I rather like to have a quiet day with G[eertje]. Here in America I have seen so many beautiful things, like flowers etc., which were on the show, so unsurpassed beautiful Jaantje said. The women of the Konijnenburg family were there already, then Ytje and Jaantje went with them. Yesterday I went a day out here in Ripon. Now we have to write the letters this morning otherwise it won't be in Holland in time. Sadie also wants to include one in this. I like it that you are able to have the parties in a Hotel. Here in Ripon there is a building called the Clubhouse, where parties can be held whether it is a wedding or anything else, which is used often. Years go fast as we could read in your letter. Ytje is already 35 years old, Trijntje's (Jaantjes daughter) daughters already married for 25 years. How is their sister Boukje doing? 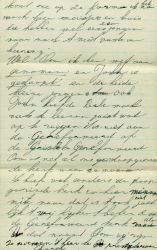 The Lolkje Bierma you wrote about, is she the daughter of Watze Bierma or Kees Bierma? 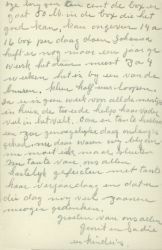 Sister Ytje wrote me then when Sietske of Kees Bierma had passed away, that Lolkje was the only one of that four who was still alive. 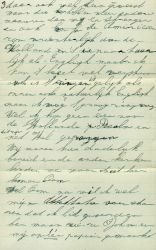 I want to hear everything from Holland, I am interested in everything and always happy to get a letter in which is written about well known people. 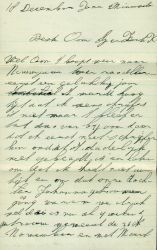 Mrs. Hiltje Terpstra will be back home when this letter arrives in Holland. Traveling is nothing these days in comparison with earlier days. I hope she had a nice trip and will have much to tell. That you may have a nice day on your birthday, also congratulations from Thies and Anna and many greetings from all of us, Your sister Boukje. [At the left side of this page is written] Did Marie Prins also visit you on the day of the party for the well known people when you had the 50th anniversary of your wedding? June 22, 1939, Ripon Calif. Mother is busy writing you and I will add a small letter to it. At the moment I am home alone, the girls are picking the weeds out of the bean field. These days every one is busy and it is pretty warm too, we start early in the morning and in the afternoon we sit under the shade tree for some time, then we can stand it I think. Johanna will work in the apricots soon, they have to cut them through, remove the stones and then dry them. They get ten cents a box, a box contains 50 lb. The one who can do it quickly can do about 14 to 16 boxes a day. Johanna did it just one year before, it last about 3 or 4 weeks. It is with one of our neighbors it is a walk of less than half an hour. Yes we don't have work enough for all the girls at home. The second one [daughter] helps her father in the fields. Uncle and aunt had a lovely day the other day, we were happy to hear so. Now I have to end. Well aunt we all wish to congratulate you on your birthday and hope that we may commemorate that day together for many more years. Greetings from all of us, Gerrit and Sadie and children. 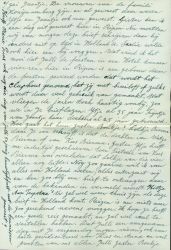 [In this envelope another letter was found which is written in a very bad kind of Dutch, some words were not written and it was hard to understand. 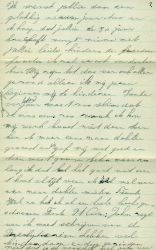 [Later on I found out the letter was written by] Mrs. John Bierma to the Hoogland family. Well Uncle it is almost New Year, so a Happy New Year. 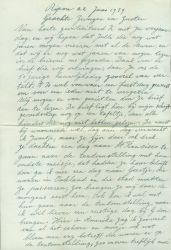 It is time to write isn't it but it didn't come till now uncle, because first I could not write because I didn't do it immediately and later on I didn't have time and because our daughter Johanna married, we were busy. Well she is already married for 4 weeks on November 26 and in March she will go to the farm. Now I have still two girls in the house and they sometimes meet a boy but still no engagement. Well Uncle I did my confirmation and John [her husband] is baptized and both little boys too. John didn't have to learn anything only to recite. It is not the Reformed or the Chr[istian] Reformed [church]. Uncle is just like our 'doopsgezinde' church but here they call that Mennonites but it also isn't that. We look more like the Reformed church as you name it Uncle we are what they call here [members of the] Presbyterian Church. Well Uncle and aunt I also want to add a letter. Our oldest daughter is married now, on March 1st she will go to the farm. Then she will live about 30 miles from here. Now she is with his grandmother and they wanted to marry before the winter because if the roads were closed they could not see each other very often. Sometimes we have terrible snow storms here, till now we have open roads, which is a good thing because we are always very busy before Christmas. I wish you a Happy New Year and I hope that you may celebrate your 50th wedding day with both your children and the other relatives, I will think about it. Till now we all are healthy but my years started to hinder me. Last year aunt it was so badly that I sometimes was so weak that I already could not do my job [the household I guess]. Then I went to the doctor and he gave me something and I recovered soon but it always comes back, so I'll have to go to the doctor again Aunt. 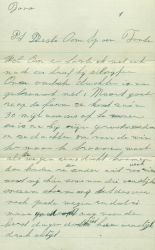 Well I already wrote a lot, Aunt and Uncle: John says I have to write you that the Presbyterians have a children's baptize and the Mennonites don't, which is the difference uncle. They have other manners than we do and are more strict. The Americans are more friendly than the Dutch and of course it is in English but I can understand it well. Also the singing is like ours, in English of course, but I like to sing. Well I didn't know one of the Dutch psalms but these all look like hymns. We were welcome here immediately Uncle and the other churches didn't come so far. Well Uncle I should like to send you my attestation [meaning testimony] that I became a member but now they made one paper of me and John and it seems not good to do so. I don't want to ask them to do it again [make a new attestation]. 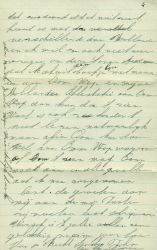 So I'll enclose a letter for Uncle Wop and my Dutch attestation for Uncle Wop then he can see it, because they could not read it of course. Enfin [In short] Uncle can ask Uncle Wop if he can see it. Uncle will know then that I am confirmed. Greet my sister from me, they have to write first. From your niece Sjoukje, John and children. [At the left side of the page is written] Thanks again.